Participants at last year’s annual networking event in Malta. BNI celebrated its 34th anniversary in business on January 8. Today, BNI is the the world’s biggest and best business referral organisation. “In some ways, it seems like just yesterday and in other ways it’s hard to believe it’s been that long. Either way, I am proud that we have had 34 years of consecutive growth worldwide in BNI. Very few companies in the world can say that,” said BNI founder Ivan Misner. 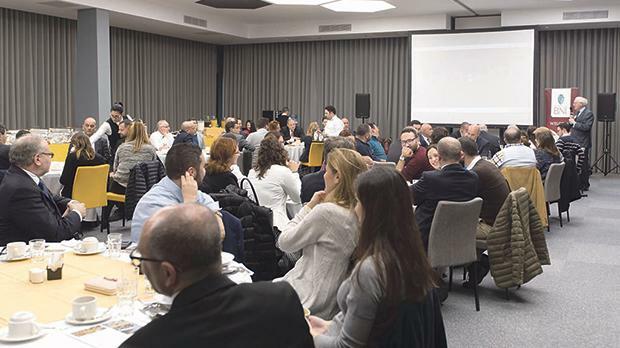 For the sixth consecutive year, BNI Malta is holding the National Networking Day on January 30, a few days ahead of International Networking Week, a worldwide initiative established of BNI and an opportunity for members and their guests to benefit from a larger business network. The goal of this initiative is to celebrate the key role that business referrals resulting from networking play in the development and success of businesses in Malta and across the world. The event will consist of an early morning meeting starting at 7am at The Palace Hotel in Sliema, bringing together representatives of various businesses and community leaders to network practically with others. Speakers, including a video by Dr Misner, will offer advice and information on how businesses can further grow and succeed through good networking practices. Local businesses seeking to establish in other countries can also find the support of BNI, as once one becomes a BNI member in a country, that member has access to nearly 250,000 passionate business leaders over 9,000 chapters across 70 countries. In the past 12 months, BNI members passed 10.4 million business referrals worth over $15.5 billion worth of business for each other. Invitations to attend on January 30 are open to the wider business community, members of other networking organisations, students, media representatives and interested parties from all types of businesses, whether in the services or manufacturing sectors. Registration for the annual BNI Networking Day in Malta opens at 6.30am, with the event starting at 7am and ending at around 9am. It is ideal to allocate up to 10.30am for post-event networking. Participants can stay on to do one-to-one meetings with other participants they would have met for the first time. It is recommended that one brings along at least 100 business cards. Participation fee, including breakfast, is €10. To find out more about BNI and its chapters in Malta, contact either Maurizio Mamo (tel: 9945 4708) or at mmamo@4sightconsultants.com or Carmel Bonello at carmel.bonello@bpc.com.mt. 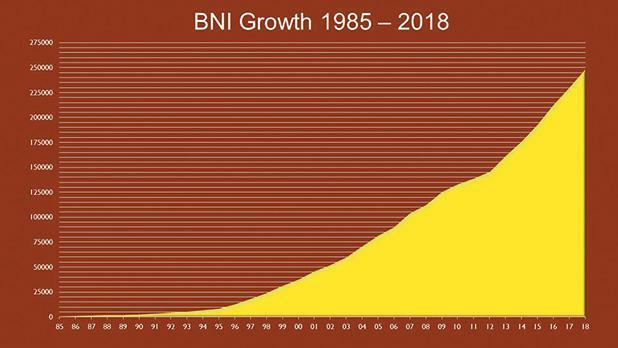 BNI’s constant worldwide growth between 1985 and 2018.